Tags: Antique Print, Asia, Banda, Indonesia, Mauritius, Ternate, Tuban. Beautifully colored engraving from the early 17th century, with views of four scenes, all numbered – depicting Dutch discoveries, taken from “Commelin: Begin ende voortgangh van de Vereenighde Nederlantsche geoctroyeerde Oost-Indische compagnie.” Originally published in Amsterdam around 1625. Probably reproduced from Theodore de Bry’s (1528-1598) “Great and Small Journeys” (Grand et Petits Voyages published between 1590 and 1601). 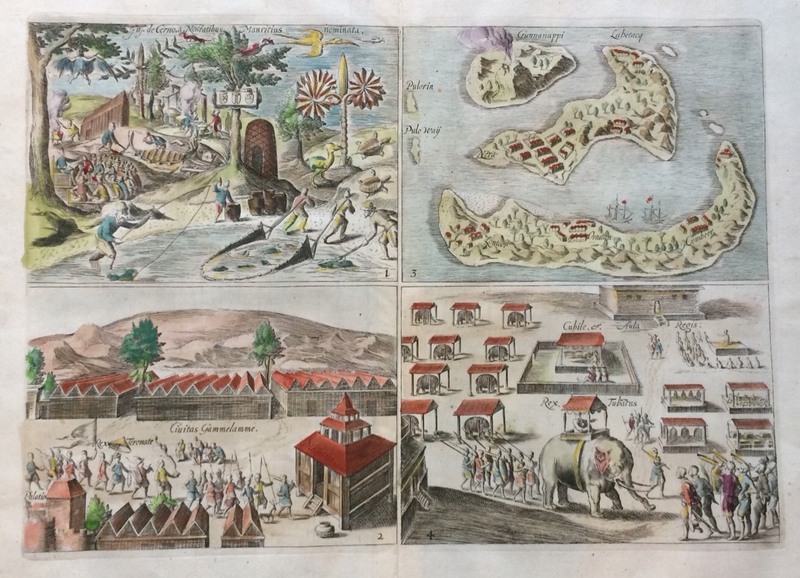 De Bry constructed a fitting engraving about his visit in Ternate, which illustrated the lavish reception Admiral Jacob van Neck and his crew enjoyed. In the caption, the De Brys explained that this event had been ‘described in detail in the History,’ implying that the illustration had indeed been constructed in the Frankfurt workshop.